WASHINGTON (Sept. 11, 2012) -- Soldiers first entered Afghanistan less than a month after the Sept. 11, 2001, terrorist attacks that killed nearly 3,000 people in New York City, Shanksville, Pa., and the Pentagon. Eleven years later, Soldiers are still fighting in Afghanistan and Army leaders want them to remember the reason and know that while they battle abroad, their families back home are being taken care of. Secretary of Defense Leon Panetta speaks to a crowd at the Pentagon courtyard remembrance ceremony, Sept. 11, 2012. "We speak in the Army a great deal about how we are a family, and that is more to us than just a saying or a bumper sticker," said Secretary of the Army John M. McHugh. "It is something we believe in and it of course starts, most importantly, with the spouses and the children, and the fathers, sisters, brothers, and loved ones of those we ask to put on the uniform of this country and to go forward." Following an observance ceremony, Sept. 11, in the courtyard of the Pentagon, McHugh said Soldiers must know that as they protect America, the Army looks after the loved ones they have left behind. "One of the most solemn responsibilities that we have here, back at home, is to ensure we are providing the kind of support and programs those families, the children need, so the warfighters can concentrate on their mission and know their loved ones are being taken care of," McHugh said. As for the Soldiers themselves, still fighting in Afghanistan, McHugh said today, as they remember the events that spurred the war they fight, the mission back at the Pentagon and of "Big Army" is to also take care of them. "They continue to be foremost in our thoughts and prayers," McHugh said. "Our main mission here is to make sure they have what they need to complete that mission and to come home safely. Today serves as a reminder, I hope to them, and certainly to all of us here as to how this war began, how this scourge was brought upon us, and how it is now our job to continue and to close out the struggles so that all Americans remain safe." 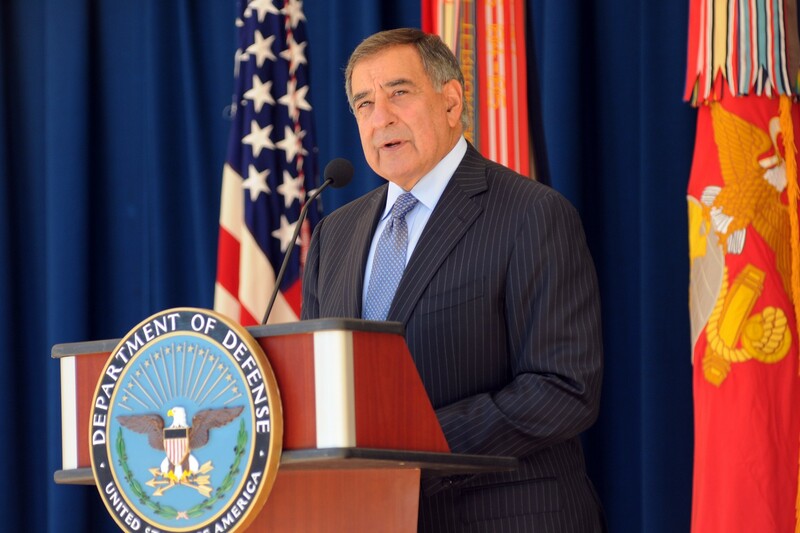 At an afternoon ceremony in the courtyard of the Pentagon, Secretary of Defense Leon Panetta addressed a crowd of more than 1,000 civilian employees, contractors and service members. Part of the recognition at the event, he said, was recognizing those that -- after the Sept. 11 attacks -- heeded the call to shoulder some of the burden to defend the United States. "Today we recognize the millions of Americans who stepped forward to answer that call and to serve in uniform," Panetta said. "They are the latest in a proud linage of Americans who raised their right hand in a time of need and volunteered to serve this country. They have carried the burden of protecting America for 11 years -- relentlessly pursuing those who would do us harm. They are truly the next greatest generation." Eleven years ago at the Pentagon, 184 people were killed when terrorists crashed American Airlines flight 77 into the west side of the building just after 9:30 a.m.
"Even as we mark 11 years since that horrible day, we know it will be forever engrained in our souls and in our hearts, as members of the Pentagon family and as Americans," Panetta said. Included among the dead were both the passengers on the aircraft and workers in the building. "They had done nothing to deserve such cruel fate," Panetta said. "We remember them and we think of their families who have suffered through grief and through heartbreak." Panetta also recognized the first responders and civilians who helped to save lives immediately after the attack. "Their actions that day reflect the very spirit of this great country of ours." The day after the attack on the Pentagon, employees who work there "displayed great resilience" when they returned to work to continue the job of supporting the nation's warfighters, Panetta said. "Thousands reported for duty the next morning, while portions of this building were still burning," he said. "Their determination showed our enemy that we would not be intimidated; that we would get right back up and that we would even be stronger than before." That America's defense force could return to work the next day was a bold statement that contradicted the message America's enemies intended, Panetta said. "Our enemies thought that they could weaken us that morning, but instead they saw this country for what it is and what it is all about," Panetta said. That is, he said, Americans risking their lives for each other, and getting to work to rebuild that which was destroyed, and that the Pentagon continues to work to defend the United Sates. "This is the enduring legacy of 9/11," Panetta said. Panetta also appeared earlier in the day, at the Pentagon Memorial, to participate in a wreath laying with President Barack Obama.